I must confess, that as many times as I have frequented Aces and Ales, I have yet to attend either a dinner event, or Tuesday Night Tastings. This is not due to a lack of faith, as I have yet to enjoy a less than stellar dish during any eating experience at this establishment. Mainly, it’s simply due to life obligations sadly getting in the way of my palate’s enjoyment. Thankfully, both Luis and I were able to attend the recent Coronado Beer Dinner, and I must say, I can’t wait to attend the next! Though I don’t often, if ever actually, talk about saisons on here, I am a bit of a fan of them. I’m not even going to bother writing about the history of saisons, because Jeff Alworth of Beervana does an incredible job doing so here. For the unaware, fellow Hooked on Hops contributor, Grant Heuer, recently got a job at Big Dogs Brewery. This past weekend, if you attended Big Dog’s Winter Beer Fest, you have Grant to thank for all the awesome beer choices. Most recently however, Grant was given the opportunity to brew his first professional beer on Big Dog’s 20 barrel brewhouse. 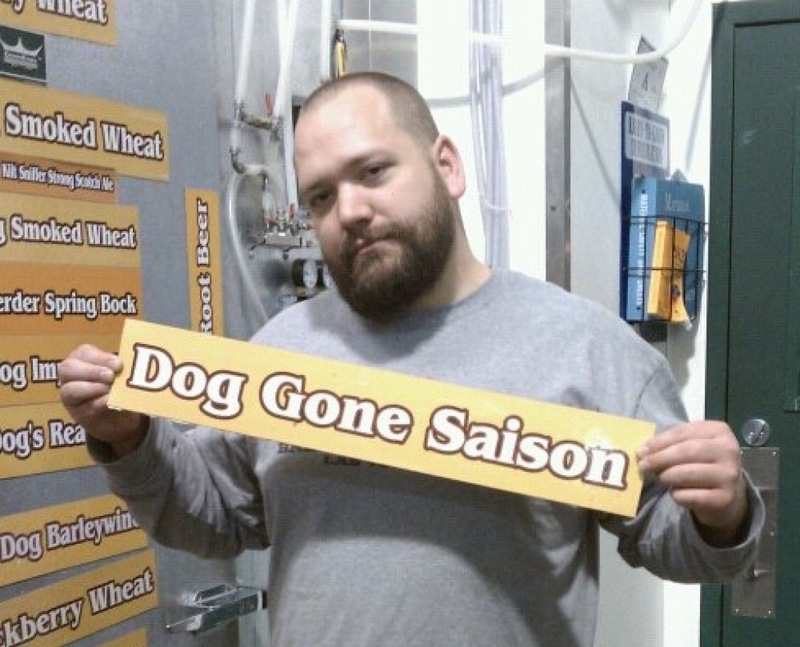 And now this Wednesday, Dog Gone Saison will see the light of day! If any of you have taken an opportunity to read BJCP Hero, then you know that Grant knows his way around a Belgian beer. He’s won several BJCP awards, and I can only assume that Dog Gone Saison will be equally award winning. This Wednesday, February 6th, get to Big Dog’s at 6pm. 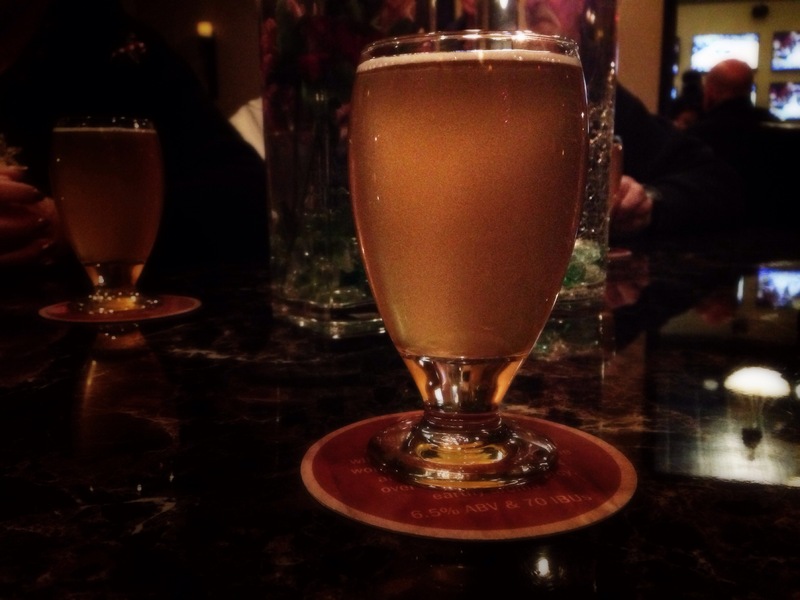 Your first pint of Dog Gone Saison is free. Not only that, the first 50 people get a free appetizer paired to go with the beer. 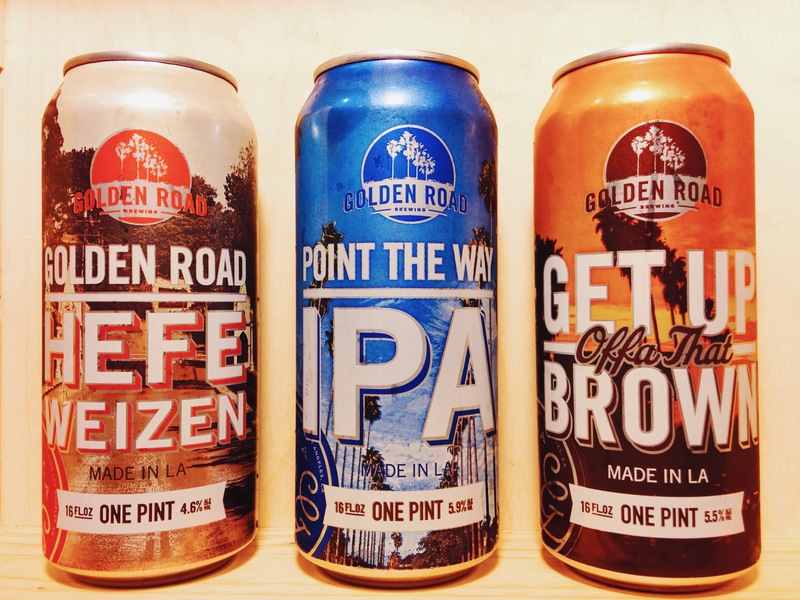 Meet us, meet Grant, and meet everyone else in the Las Vegas craft beer community. Lately I’ve been trying to figure out what the primary driver of innovation in craft beer is. Is it consumer demand? Do savvy brewers notice shifting tastes or coming trends and whip something up that fits the bill? Does the local brewpub brewer get badgered by enough beer geeks and homebrewers that he decides something like a Nelson Sauvin IPA is worth a shot? Or are some of the more innovative offerings a result of the brewer’s desire to make something that he or she finds interesting? 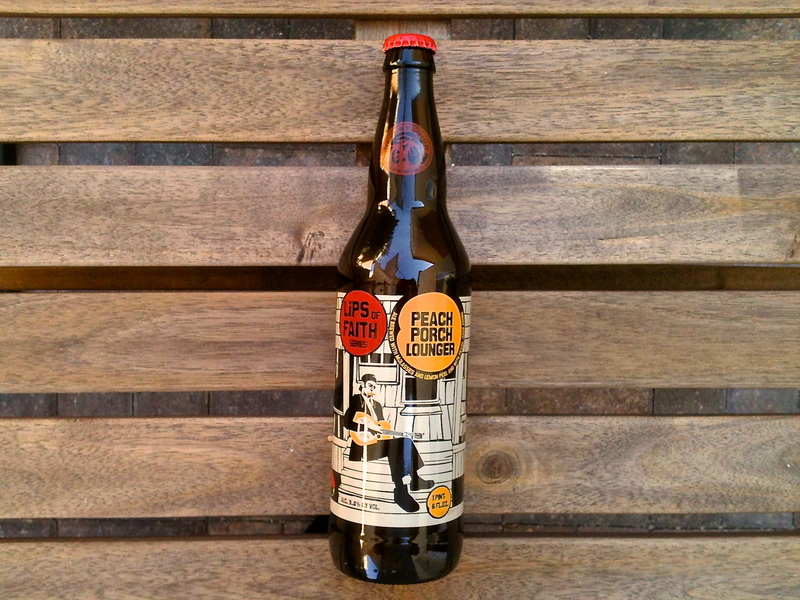 To what extent can professional brewers push the envelope and get consumers to follow? Any rational person might’ve thought a hop monster like Stone Ruination IPA was wildly out of place in the craft beer market 10 years ago. Now, not only is it my regular go-to when I want my tongue to swim in a sea of C-hops, but it’s one of the highest rated Imperial IPAs around. Hell, I can get a bomber of it at the gas station down the street while picking up a meatball sub. Now you may be wondering why I’m spending so much time thinking about this topic, let alone writing about it. I doubt it’s keeping many of you up at night or fueling in depth discussion at your dinner parties. It’s at this juncture that I’ll let you in on a well kept secret: I plan to be a very successful and well-decorated brewer in our quaint little town of Las Vegas. So how does a lowly homebrewer go about doing this? The first step starts Monday: A part time job at Big Dog’s Brewing Company. I’ll be washing kegs, cleaning lines, graining out the mash tun etc. It’s not glamorous, but it’s a foot in the door at one of the finest and more innovative beer habitats in this town. Trust me: if you haven’t had Dave Otto’s hoppier offerings like Dirty Dog IPA & War Dog Double IPA, you’re doing yourself a terrible disservice. We may even strip you of your Hop Head merit badge. All that aside, we get back to our initial line of questioning. 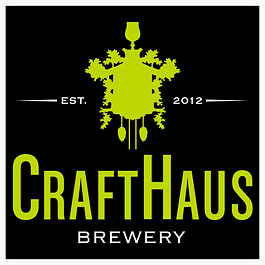 If I get the opportunity to develop new beers in this highly customer-interactive brewpub setting, what’s the best way of going about it? My first inclination is to lean on what I’ve been successful with and enjoy drinking. Who doesn’t like a Saison with a ton of fruity aroma from dry hopping? Probably a fair number of you out there. That’s where the real fun of a brewpub setting comes into play. I can talk to you while you experience the fruits of our labor. You can come pepper me with questions and comments any time you like. Please trust me when I tell you that I want to know what you liked, what you didn’t, what new experimental hop you’re homebrewing with, what beer you loved from your recent trip to a new brewpub in Antarctica, what you had for breakfast, etc. I want it all. I want to push the envelope, innovate, and make great beer by hook or by crook. Whether it’s a crazy idea I have, or it’s based on something you and your buddy drunkenly brewed in your kitchen, I’m all about it. In the process, I hope we can help our local brewers make great beer for you, and thereby thrive. Most importantly though, please come fill as many growlers as you can if Big Dog’s has a new seasonal farmhouse style beer! Just in case my fancy schmancy beer geek Certified Cicerone tastes don’t quite latch on to the taste buds of the masses. The phonetic similarities between the two should be enough of a clue that these are meant to be together. Like some sort of alluring alliteration, I decided to pair a saison with my grilled salmon. The Salmon: I marinated the salmon in olive oil and lemon juice (from actual lemons, not a bottle). After it was grilled, I seasoned it with a little salt, and some fresh ground pepper. The result was a deliciously lemony fish with a spicy, peppery edge. The Saison: The only saison in the house was Saison du BUFF, a collaboration beer between Stone, Dogfish Head, and Victory Brewing Company. This is no ordinary saison. It is brewed with parsley, sage, rosemary, and thyme, fresh from Stone’s garden. These herbs give the beer a peppery taste with a very refreshing, herbal finish. The amarillo hops give this beer a citrusy zest like aroma and taste. 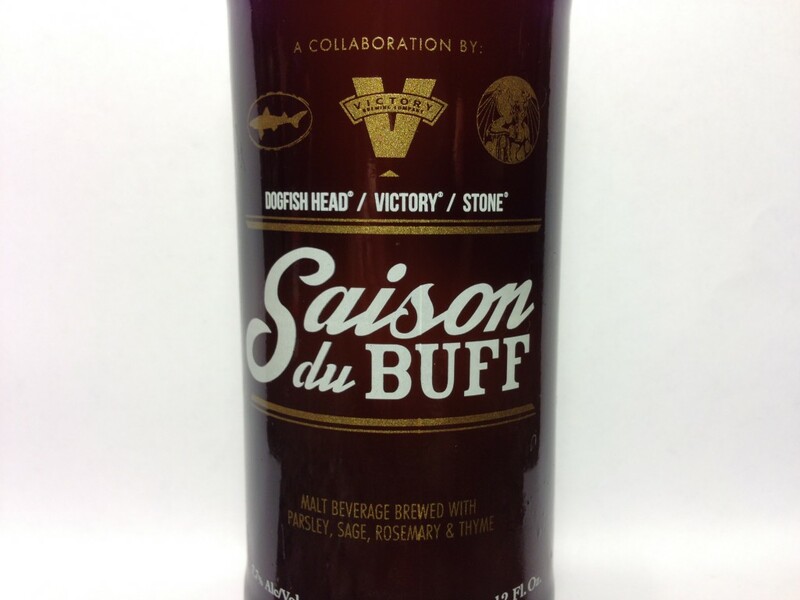 A very floral and herbal take on the saison style. The Pairing: This pairing was all about complimentary flavors. 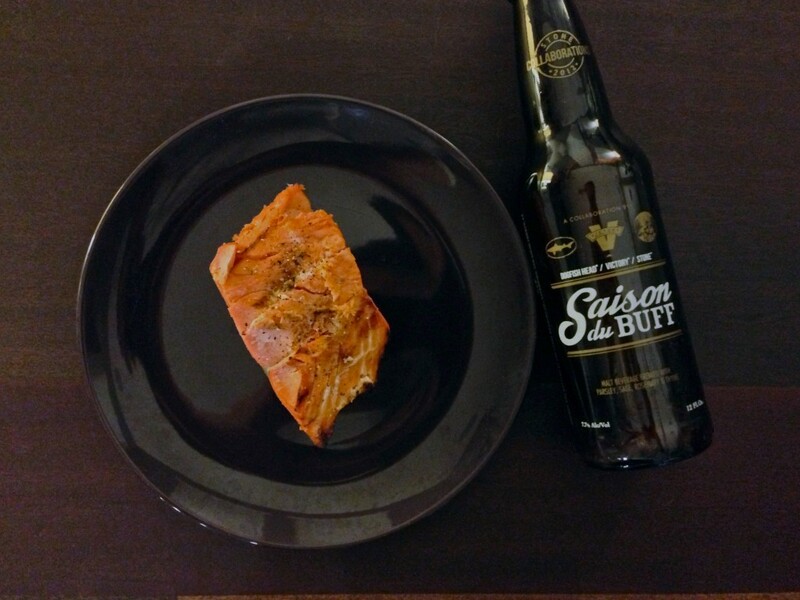 The citrus zest in the beer matched the lemony tartness in the salmon. The fresh black pepper matched the peppery saison yeast and the herbal finish in the beer was like an added seasoning to the fish. The naturally lighter flavors of the fish was a perfect pair to the light, bready malts in the saison. A fantastic pairing, if I do say so myself! 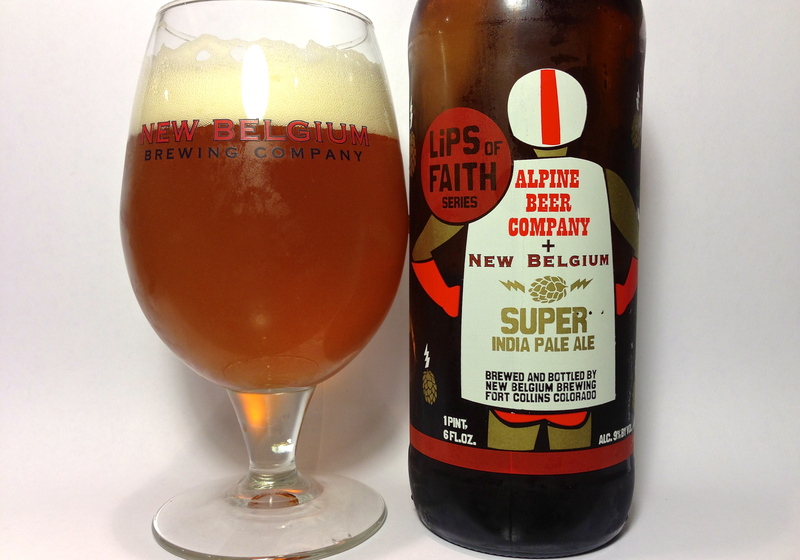 Over the past year, I’ve been very impressed with New Belgium’s Lips of Faith series of beers. 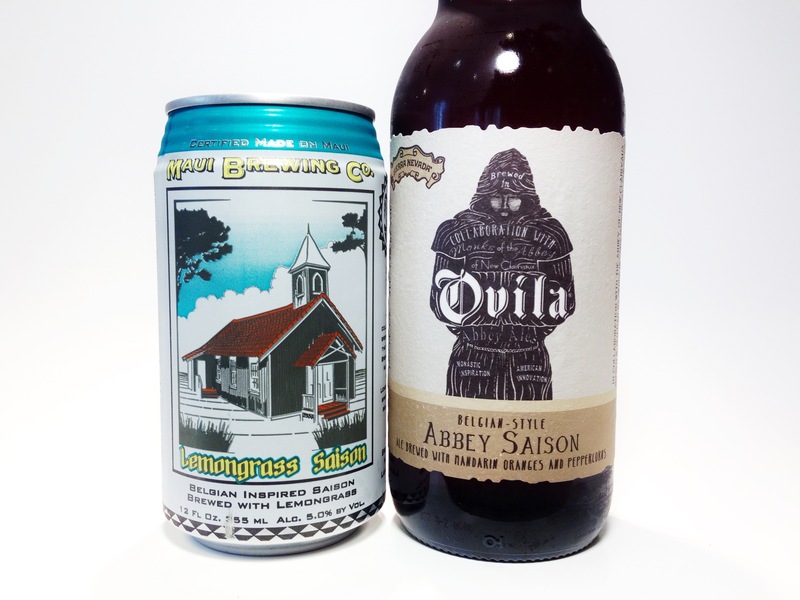 The collaborations they’ve started making with other breweries has been fantastic. Last year’s Kick, made with Elysian Brewing from Seattle, is still one of the most unique, and flavorful takes on the fall pumpkin beer theme. This year’s Brett Beer, made with Lost Abbey from San Marcos, was an incredibly refreshing beer that should age very well. More recently, Super India Pale Ale, from New Belgium and The Alpine Beer Company, brought immense flavor and balance to the over saturated IPA market. 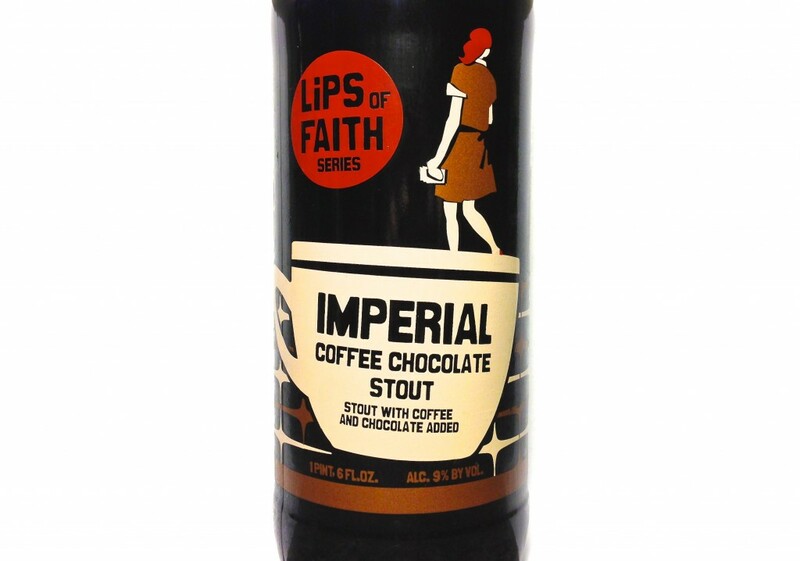 About a week ago, New Belgium released the last of it’s 2012 Lips of Faith beers. Bière De Garde is a collaboration beer made with Brewery Vivant from Michigan. I haven’t the chance to try this yet, but I’ve heard several people call this one of the best of New Belgium’s beers. The second Lips of Faith beer that New Belgium released last week was Imperial Coffee Chocolate Stout. I tasted this beer on tap last Wednesday at Khoury’s. Once again, New Belgium shows it’s ability to combine and balance multiple flavors into a beer that not only highlights each element, but also succeeds in not overdoing it. I’m convinced that this beer has some lactose in, as the smooth, creamy mouthfeel, and residual sweetness remind me of every other milk stout I’ve had. I’ve been told that there is no lactose in the beer, so I’m wondering if this sweet, creaminess may be coming from the chocolate in the beer. The coffee flavor is incredible. This beer really does taste like a black cup of coffee with some sweet creamer added. Again, I assume that this sweetness is coming from the chocolate, which, by the way, is perfectly balanced in this beer. Not over top, but some definite chocolate undertones present. If you are a coffee lover, like myself, then I highly recommend you try this beer out. It is currently on tap at Khoury’s as well as Aces & Ales. Also pick up a bottle of Bièr De Garde while you’re at it!